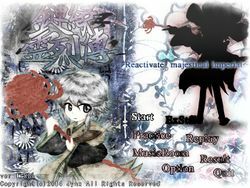 This page lists other documentation in regards to Reactivate Majestical Imperial. 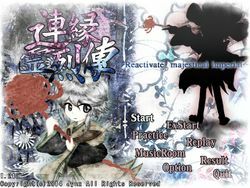 "Len'en Reiretsuden ~ Reactivate Majestical Imperial"
is another installment of the bullet hell STG series where folks of unclear gender go do this and that. Those spirits, with seemingly no reason, were gathering somewhere. It was dreadfully cold." こんなところでも避けるのか・・・ You're still dodging, even here...? 殺すのは最後にしてやる You're an interesting one. I like you! Apart from a secret playable character being implemented, there were also some significant changes to the game between the previous v1.00a and v1.10a. Some 3D background were re-worked on. The player now starts with 2.00 power for the extra stage rather than no power. v1.21a further had bugfixes related to scoring. Jun Amanomiya's umbrella sprite were left from Earthen Miraculous Sword. No enemy shoots umbrella bullets in this game, rendering this sheet unused. There are two unused enemies in the game: a black T-shaped enemy with a green eye in its center, and a grey-and-black enemy that resembles a snake with wings. These have been here since Evanescent Existence. When clearing a stage with Suzumi Kuzu, the stage cleared screen shows Adagumo no Saragimaru and Kuroji Shitodo rather than Suzumi. This was fixed in v1.11a. On the stage title cards, "Stage 1" etc. wouldn't appear in v1.10a. The SFX on Stage 5 might go quiet. ↑ This quip (read as nakittsura ni sake) is based off of the Japanese expression nakitsura ni hach (泣き面に蜂), which is roughly equivalent to the English "misery loves company". ↑ A reference to a line from the film Commando: "You're a funny guy Sully, I like you. That's why I'm going to kill you last." This page was last edited on 24 January 2019, at 06:02.